Off Lease Only, the nation’s largest independent used car dealer by volume, is pleased to announce that its dealerships have received the 2019 Edmunds Five Star Dealer Award. This prestigious accolade is given 100% off customer reviews and feedback on Edmunds.com. The award, based on the number of five-star online reviews a dealership receives, was given this year to less than three percent of the dealers who partner with Edmunds. Receiving the award for the fifth consecutive year is the Off Lease Only store in the West Palm Beach area and the store in Orlando. 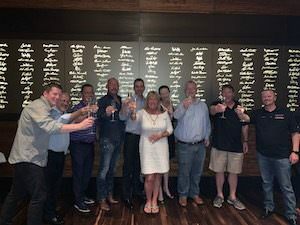 A third store, which opened in the Fort Lauderdale area in late 2017 and just completed its first full year, also received the Edmunds Five Star Dealer Award. To qualify for the 2019 Edmunds Five Star Dealer award, dealerships must receive 30 or more five-star sales reviews on Edmunds.com in 2018. The three Off Lease Only dealerships have far surpassed that number. Off Lease Only’s Orlando store had 126 five star reviews, Fort Lauderdale had 68 and 56 customers gave the West Palm Beach store five stars. “It’s clear that shoppers hold a high opinion of Off Lease Only and the services you provide,” Edmunds CEO Avi Steinlauf said in a letter to Off Lease Only. 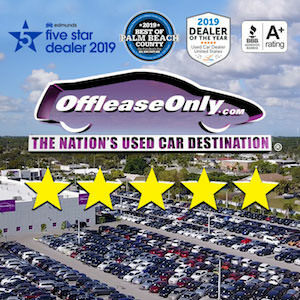 Off Lease Only is a leader in offering outstanding customer service, receiving an A+ rating from the Better Business Bureau and also getting great online reviews such as the Edmunds Five Star Dealer award. “It’s not enough to just sell cars thousands below retail in this day and age, incredible customer service is a must and the reason for our continued growth!” said Fischer. 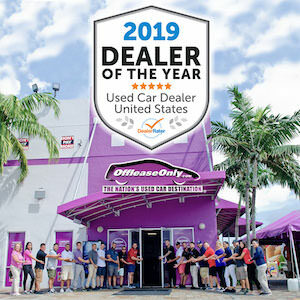 It‘s Miami store was named Used Car Dealer of the Year from DealerRater.com for the entire United States based on customer reviews just last month. Off Lease Only, the Nation’s Used Car Destination, makes it easy for customers to save thousands on their next pre-owned vehicle. To check out Off Lease Only’s wide selection of more than 5,000 used cars, trucks, SUVs and vans ranging in price from under $10,000 to more than $100,000, simply CLICK HERE. You are sure to see why Off Lease Only continues to win the title of Edmunds Five Star Dealer year after year.